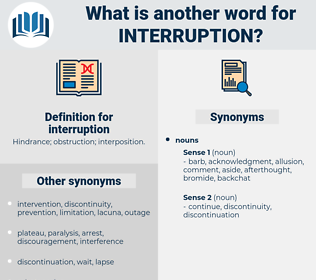 What is another word for interruption? pause, disconnection, downtime, failure, cutting, lapse, shut-down, cessation, parenthesis, withdrawal, abortion, gap, abandonment, continuity, disturbance, clipping, intrusion, hindrance, breakup, absence, Ceasing, jamming, loss. 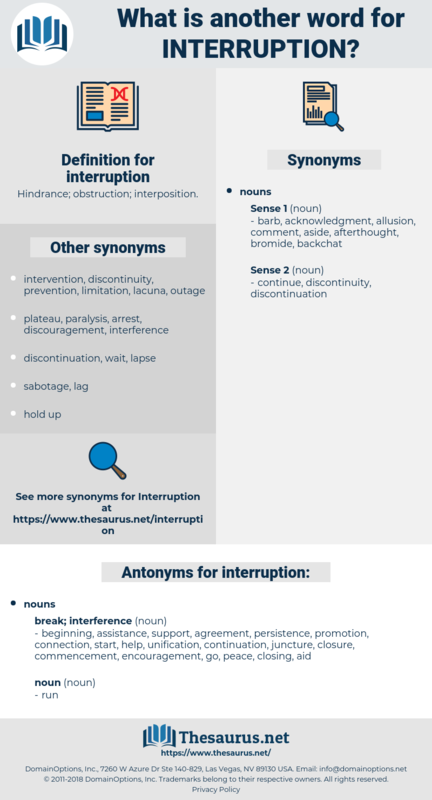 interrupted, interrupt, discontinuation, outage, discontinuance, blackout, Interrupting. adjournment, stoppage, discontinuity, breakdown, interrupt, discontinuation, rupture, recess, obstruction, outage, discontinuance, blackout, halting, cut-off, let-up, stopover, standstill, closure, respite, breakage, breach, severance, impediment. beginning, assistance, support, agreement, persistence, promotion, connection, start, help, unification, continuation, juncture, closure, commencement, encouragement, go, peace, closing, aid. It was a time of continual joy without interruption. Here war had had its grim way without interruption.